The Virginia Mason Medical Center is based in Seattle, Washington. Since the Virginia Mason leadership’s first visit to Japan in 2002 to seek insights from Japanese manufacturing, the hospital has evolved into a leader in the application of lean principles to health care. The development and implementation of the Virginia Mason Production System is a standout case study that holds lessons for any leader looking to adapt the principles of the Toyota Production System to a non-automotive environment. Virginia Mason’s journey has been the subject of a number of books on the topic of lean management in health care, including the excellent Transforming Health Care by Charles Kenney (the book we have gifted most often to our clients at Shinka Management). Whilst the application of Total Quality Management and adoption of Kaizen culture has a longer history in Japan, with evidence of Quality Circle and related improvement-focused activities in Japanese hospitals dating back to the 1970′s (Tateishi, 1994), the Virgina Mason Medical Center deserves attention for its success in learning from the Toyota Production System and implementing an organization-wide management system that influences Virginia Mason’s entire approach to patient care. There are few environments and workforces that present more complexity to the task of organizational transformation than a hospital, and yet by all accounts Virginia Mason is achieving impressive success on this journey. Since a crisis period with financial losses in both 1998 and 1999, Virginia Mason has since achieved positive margins every year since implementing the Virginia Mason Production System. Together with the significant improvements achieved in efficiency across the organization, safety, quality and patient satisfaction metrics have also seen impressive improvement. The Virginia Mason Medical Center has subsequently been recognized as a Leapfrog Top Hospital every year since the award has existed. Virginia Mason’s achievements to date adds another chapter in the story of the development of lean, with the various exchanges of ideas between the US, Europe and Japan over the last several decades. Following W. Edwards Deming’s influence on post-war Japanese manufacturing quality, and Taiichi Ohno’s leadership in developing the Toyota Production System and its subsequent export to the West, we are now seeing the Japanese health care industry turning its attention to the progress being made abroad in organizations such as Virginia Mason. The following interview with Chairman and CEO Dr Gary Kaplan and Transformation and Executive Sensei Dr Henry Otero, was conducted at a lean health care conference held in Kyushu, Japan, to share learnings between Virginia Mason and the Japanese health care industry. In sharing their experiences on Virgina Mason’s lean health care transformation journey, Dr Kaplan and Dr Otero provide insights that holds lessons for any of us seeking to lead effective transformation and culture change within our own organizations. Dr Gary Kaplan is a practicing internal medicine physician, and has served as the Chairman and CEO of Virginia Mason Medical Center since 2000. Dr Kaplan has led the adaption of the Toyota Production System to transform health care delivery within Virginia Mason, and has been the recipient of numerous awards and recognition for this work, including the John M. Eisenberg Patient Safety and Quality Award issued by the National Quality Forum and the Joint Commission. Dr Henry Otero, is a medical oncologist, and is a Transformation and Executive Sensei at the Virginia Mason Institute. Dr. Otero has led many process improvement events at Virginia Mason, with a focus on improving physician and executive engagement and creating ambulatory flow. Paul Smith: What is the Virginia Mason Production System and what does it seek to achieve? Dr Henry Otero: It’s a management system by which we direct all our activities and align the goals of the organization and the work we do every day. It’s also a robust organizational system which guides us in understanding who we are as an organization, what goals we are trying to achieve and how those goals align with the work that we are doing throughout the organization, with a view of achieving world-class management. One mistake is to believe that we only need to learn the tools and methods to become a lean organization. The other is to believe that leaders don’t have to lead or understand the methods deeply. The leaders must be the most committed to understanding and utilizing the methods in order to be role models for the rest of the organization. There’s a big difference between lean as a project improvement method whereby we just use it to solve problems with tools and ideas, versus a management system which aligns the work we do every day and helps us to accomplish the goals we want to accomplish within our organization. Smith: Why did Virginia Mason look to a Japanese management methodology to be its guiding light? Dr Gary Kaplan: We don’t think of it as a Japanese system but as a system that was started and perfected in Japan; in some ways it goes back to Deming and others. A lot of people ask us why we go to Japan to learn – if we want to learn the very best surgical technique, we go to the place that does it the best to learn. That’s how we think about management. I think the bigger question was why did we, health care professionals, go to manufacturing? Because that was a big departure. Historically in medicine, we’ve always thought that we had all the answers, and that those answers were somewhere in the health care industry. But, when we were looking for a management method, we didn’t find it. Nobody in the U.S. had one in health care. Dr Kaplan: We saw Boeing. We heard what Boeing had been doing. We met somebody who had been working at Boeing, John Black. He had been leading the Toyota Production System development at Boeing. So, we went to Boeing to learn from them. Before we ever came to Japan, we went to a company called Wiremold, and met with Art Byrne. The whole executive team visited Wiremold in December of 2001. It was amazing. Unlike Henry or myself, most of the executives had never been in a factory. So, we were beginning to think that maybe the answers were outside of the health care industry. That was a big departure for us. Smith: When did you decide to take your executive team over to Japan? What was the purpose of doing that? Dr Kaplan: Well, the people at Boeing said that if you were really serious, you need to go to the source, you need a deep immersion experience. We came home totally different – we were thinking differently – that’s why we continue to take people to Japan almost every year. Smith: What was the difference? Was it knowledge or attitude, or was it belief, a change of thinking about what’s possible? Dr Otero: We have lots of answers to that. One answer is that it was learning in a different culture, looking at something that you were not familiar with seeing; Toyota’s history, Toyota’s production, working on a line in Hitachi; and then each night was a debrief, a very long debrief of what we saw, what did it mean to what we were doing at Virginia Mason, and what is the relevance to health care? And those discussions were the best when people started to talk about what their real hopes were for themselves and when we started to realize that things could be different. There was a way to do it differently. You didn’t have to be stuck in the way it was currently being done. You could aspire to do something different. You could see in front of you, what you are aspiring to. That was very motivational to people. For some people, it was that switch – they just caught on fire. That was the most important trip I have taken in my life. It fundamentally changed the way I think about health care and what my motivations were. Dr Kaplan: I think the best aspect of that is to take people out of their comfort zone. Being in our comfort zone keeps us from processing information. We always fall back on what we know to be true and our foundations. Here, we are out of our comfort zone. We levelled the hierarchy. When you have a surgeon dependant on a nurse or medical assistant to help them understand what’s going on in the assembly line it flattens the hierarchy that exists in health care. As Henry says, a big part of the trip is being away from home and in the deep conversations we have with each other, many of which are structured fundamentally – I lead those – and many of them are also impromptu conversations including confronting our own weaknesses or things at home that aren’t going well that we are hesitant to talk about. These trips have been powerful enough that we continue to do them. Smith: Fast forward to today and looking back over the journey and some of the outcomes, what is it that you feel most strongly about in terms of what’s been achieved? Dr Otero: As I look across the organization, it is people’s focus on the patient and how they approach problems. Their questions about what benefits the patients. What you keep seeing and hearing at Virginia Mason is people asking what’s best for the patient, and this guides us to which ideas we are going to implement and in what direction. I think this is the culture piece that I don’t see or hear anywhere else. A lot of people say that they are patient-centered, but you have to hear it from the leaders. Can they give up their own self-guided interests to those of the patient? When you see that happen, you know you are in a special place, as that doesn’t happen very often. Dr Kaplan: Yes, I would agree and it’ is the hardest thing to change and the most important. The management system is really important, the tools and creating flow, providing hope, but it’s the cultural change and the willingness that is key. I think we challenge some really deeply held assumptions about our culture and it sounds like such a no brainer, so obvious. But it’s really, very profound when you think about changing the culture in medicine. Some people say, well if the patient is first, if the patient is at the top, does that mean that the doctor is at the bottom? And there are a lot of conversations about things like that. Some people had to leave the organization because they couldn’t go there. Smith: Was that because of a shift from a doctor-centric model to a patient-centric model? Is that part of what the shift was? Dr Otero: Yes, I would say we were like most organizations. We designed process around the physician and that was the way it was. Dr Kaplan: And, we were proud of it too. Dr Otero: Yes, we recruited people based on that. The shift away from that to patient first was challenging. The rhetoric of “patient first” is easy. You know what “patient first” is but then, looking at patients’ experience, per se, and asking each other, “Are we really patient first? What does it mean to put the patient first?” I think that was really the challenging part. Dr Kaplan: We are still learning about that but, do we really understand what it means? In the old days, because we were also patients, we thought we knew, but we didn’t. Then we did surveys and figured out what patients wanted. We focused on what we heard from patients. Until we really engaged them as equal partners in the design of care, we really didn’t know what they wanted. How do we do this? We have patients on our improvement teams. We engage in co-design. For example, we may have a team of six health care people and a team of six patients designing new processes in care. Smith: You mentioned that the cultural change is something you look back on with pride. What do you look for in people that are able to promote that culture internally? What do you look for in leaders of the Virginia Mason Production System? Dr Otero: I think the attribute of a leader that is most challenged by the Virginia Mason Production System is growing from a great problem solver, which is generally what people get into leadership positions for in that they can solve problems for their people, to reframing yourself as a coach and mentor and a great problem framer, and being able to know how to encourage, coach, pull and engage people in solving. They solve the problems and you frame the problems, and give them the resources, and ask the right questions. You become a great questioner as opposed to a solver. And that’s a very hard journey, I would say, for leaders, to transition from problem solver to problem framer. Smith: Does that involve them needing to bite their tongue when they see a solution in their mind as sub-optimal? Dr Otero: Sometimes you will be in an improvement event and you and even your whole team know the answer. You just want to blurt it out to this team that seems like it is struggling with coming up with an idea, or they come up with an idea and you just know that it’s not as good as the idea you have. Yet, it’s not the idea, it’s the process of improvement that you’re trying to get to. This is the hard thing as a leader. You are not trying to get the answer. You are trying to engage the worker in the process so that they can continue to come up with many answers over the span of time that they are working for you. The more important thing is to let them go through the process, generally PDSAs (Plan-Do-Study-Act), and almost invariably they find an answer that is better than the one you had in your mind and that’s the humbling part of it. At the end of it, letting the process go, you will find people will come to an answer that’s even better than the one you had. Smith: I think it’s a great point. Often people forget that the process of kaizen is not necessarily about finding an immediate answer to a problem. It’s more about developing your people to be problem solvers over the long term. Dr Kaplan: Yes, building capabilities amongst team members so that they can imbed problem solving into their daily life and daily work, and not all traditional health care leaders are able to lead that. They are used to hierarchical decision making, (leaders) swooping in and solving the problem. You also have to have a high tolerance of ambiguity and the ability to use humble inquiry when asking questions. Asking questions because you genuinely don’t know the answers, and you want to know. That’s a big levelling opportunity that we have as leaders that I don’t think we take advantage of enough. Smith: Some of the biggest mistakes you made on the journey? Dr Otero: I think one of the things is that we could have been quicker in is moving to the aspects of daily management. The elements of being able to sustain change and engage workers ties into the elements of daily management. That might be something we could have moved to earlier. On the other hand, we may not have known if people were ready and understood enough about it. Smith: What were you doing in place of that? Dr Otero: I think it was more top-down leadership driven as opposed to having that structure at that level of the group. How do we engage our teams every day and make the work that they have to do visual? Our daily management structures were more focused around making the work visual for things like production management. Dr Kaplan: We were focused more on training I think in the early years. We should have moved more quickly to daily management. I also think we needed, and still need, more rigor around 30-60-90 day follow up, going deeper. I think we have learned a lot about scoping. In early years, we might have scoped things too big, too small. I think we are getting better at that. A lot of people accused me of having too much patience for people, and not moving people along fast enough. I wanted to bring everybody along, but not everybody could come. Smith: What would be your advice for a hospital considering starting on this journey? Where do they start? Dr Otero: Yes, it has to start at the top. And, there are a lot of ways to learn. One way is to read the book, Transforming Health Care and I think this helps give a little better sense of the potential impact. And, I think a visit to an organization that is doing lean and lean health care is a really great way to get people exposed and understanding what they are getting themselves into and to see if they have the culture and the motivation, and if the leadership have the willpower to go on the journey. There is nothing worse than to start a journey and not know what you are getting into and then say that lean doesn’t work. Better to do the background work of investigating some organizations that have been successful, especially if you are in the health care industry. Visit one or two of those organizations to see how the leaders behave differently, how they are embedding it throughout the organization, how does it translate to the front line. Then have an honest discussion with your own leadership team; asking, “Can we go on this journey, do we have the motivation, do we have the interests and alignment?” It’s not an easy journey, but it’s a very rewarding journey, probably the most rewarding journey you can go on. You have to go up against a lot of cultural norms. That’s where I think people should get started. Then, if there is interest, look at who could they work with to get training and to find a sensei that can help guide both their executive teams and also help them with training within their organization in lean management and lean practices. Smith: Do you find more resistance or more challenges to this type of thinking in the public sector as opposed to the private sector? Dr Otero: There are pros and cons but I think it’s very applicable to both. We work with many organizations in the public sector and they have been some of our most successful clients at adopting it across national health care systems. They have different resources and constraints compared to the private sector, but we find that they can be successful if the leadership is interested and committed, and truly whether they are private or public doesn’t make that much of a difference as long as they have a leadership and government that are interested in going in that direction. Smith: Dr Otero, on the topic of leadership, what are some of the attributes that you see in people like Dr Kaplan as the leader of the organization and the leader of the culture that they do well that enables this to succeed. Dr Otero: A visionary leader. Someone who leads with vision, and finds the passion behind the work we do. Someone who uses things like economics as urgency but not as mission, focuses and continues to bring you back to the mission of your organization – what you value, and tie that into the improvement activities and the management methods. Through connecting the dots a leader creates a vision for the organization that you buy into and knows how to create that as a shared vision within the organization. That’s a real leadership skill that leaders who are very successful, like Dr Kaplan, adopt; it’s called “adaptive leadership.” It’s a skill that Ronald Heifetz identified in the Harvard Business Review regarding being able to allow people to solve problems and recognize that sometimes we shouldn’t shield our people from problems but should expose them to problems, let them struggle sometimes so that they can come up with the solutions, not the leader coming up with the solutions. So, they have great adaptive leadership skills to engage people and they have the ability to be vulnerable, the ability to listen to the voices from many different areas when they are making decisions. Smith: Finally, what’s next for the Virginia Mason Production System and for Virginia Mason? Dr Otero: I think we are on a journey, we are babies on the journey. We are infants. So, we still see this as something that will develop beyond our lifetime and beyond the leaders that are here today. We continue to work at how we can better integrate our processes across many different silos that we still have and to really focus on the care of our patients. I would say in our work, there is no finish line. It’s a journey and there is a lot of room still to go where health care is regarded. We are humbled by where we have come from and we are humbled by the amount of work that still has to be done to create a terrific patient experience, which is our main motivation. Paul Smith is a Director of Shinka Management, a lean training and consulting firm with clients in 48 countries. 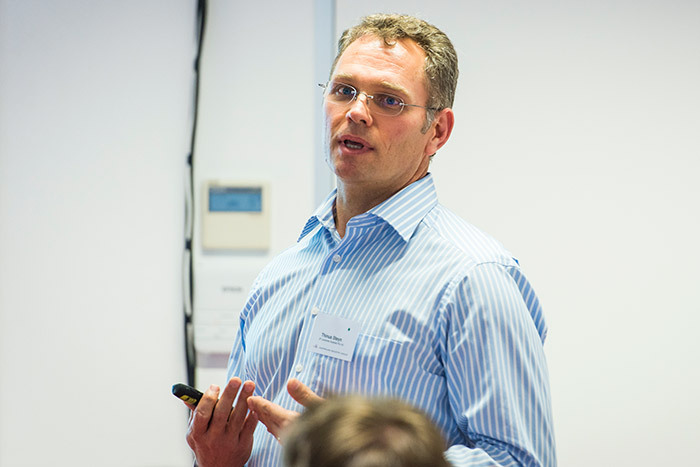 Paul completed his engineering studies with a masters and PhD from Kyoto University, and has been mentored in lean management by some of Japan’s most notable lean practitioners including former Toyota factory managers. Paul runs lean training courses with Shinka Management and is a regular leader of the Shinka Management Lean Japan Tour. Images of Virginia Mason Medical Center and staff used with permission of Virginia Mason Medical Center and Virginia Mason Institute. We have again had the pleasure of visiting one of our favourite companies in Japan – and one that clients on our regular Japan study mission continuously rate as a standout experience of their time in Japan. As a lean factory, this company is an excellent example, and the benefits flowing from their lean culture in terms of safety, quality, productivity, shortened lead times and improvement in market share are impressive (more on this below!). However there is another angle to the company that is equally impressive and has a strong positive contribution to its sales – its formal strategy to hospitality and showcasing its factory. The Isuzu Group is the steel service division of the Japanese multi-national giant Metal One, specializing in the processing and sales of cold rolled steel. 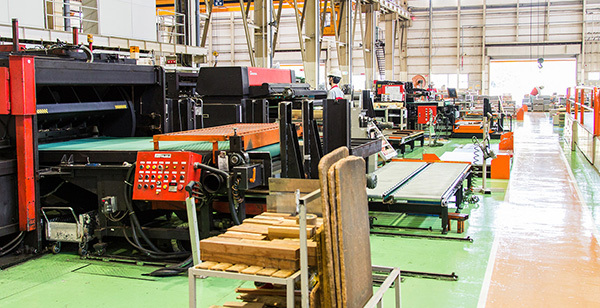 The company has several regional service centres across Japan that process (typically slitting and cutting) steel coil of various grades and thicknesses for distribution to a range of industries, including automotive, that demand reliable and timely service. Isuzu believes that coil distribution is old economy and that in order to remain profitable in this mature industry the company must focus on cutting costs by boosting business efficiency. 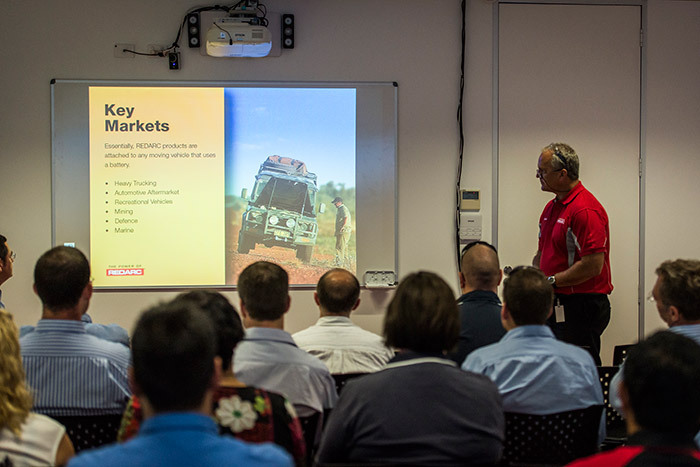 To tackle this challenge, Isuzu has developed a very special culture focusing on staff development and continuous improvement – and the results show in the quality of their products and services, the morale of their young and vibrant workforce, and the market share held by their company. Amongst the various programs the company has in place, its “factory as a showroom” vision is one that often flies under the radar, but in my opinion, is tremendously valuable and should be held up as an example for our clients to mimic. I’d like to highlight the value in this approach of leveraging a strong culture of continuous improvement and lean manufacturing to support corporate brand development and increase sales. See below a video snapshot of the hospitality provided by Isuzu on a lean factory tour. Our first visit to an Isuzu Group service center with our clients was in 2014 following a fortunate introduction whilst implementing a lean manufacturing program at one of Metal One’s off-shore processing facilities. The ex-pat Japanese CEO described Isuzu’s service centers as a must see example of what an engaged workforce could achieve through continuous improvement. Even with these high expectations we were amazed by what we encountered on our first and every subsequent visit. The presentation of the factory is the most obvious initial wow-factor for many of our clients. In comparing with the presentation (or lack there-of) of metal processing facilities in our own countries, the Isuzu Group service center was a standout for its clean, attractive and well-organized environment. On closer inspection we could see the hallmarks of a thorough 5S program, something we discovered that they are extremely dedicated to – with a 5S Patrol and Safety Patrol carried out daily, with the responsibility for these audits shared across every member of their factory, office and logistics staff. With time we were noticing the depth to which their program was implemented. On one occasion, we noted that they had even run their 1S “sort” filter across the buttons on their machines and control panels, dividing buttons into “necessary” and “unnecessary” categories, and uninstalling and blanking out those that were not required. They explained to us the benefits that resulted from less buttons, dials and levers, in terms of easier training and less operational errors. The results of a strong culture of lean manufacturing and continuous improvement have been well documented, in terms of safety, quality, productivity, staff morale, lead time, company profitability and sustainability, and other metrics. All of these factors are on show during our visits. As we walk into the factory, we first pass the board tracking their safety record – a subtle reminder to staff each day of the need for safe work practices. Impressively, the service center we most often visit has achieved a record 2496 days straight (nearly 7 years) without a paper-cut level injury. Part of the secret to this is the approach to safety training taken by the company. 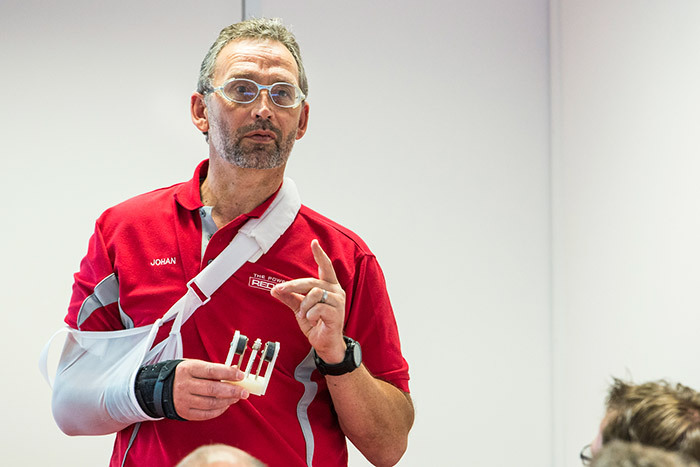 Recognizing the limited value in lecturing staff on safety in a meeting room, all safety training takes place on the shop floor with each staff member responsible for creating incident demonstrations that can be experienced by all employees. Rather than talk about the danger of a coil suddenly unraveling, metal sheets falling from a crane, a worker being crushed by moving equipment, etc., they choose to create these safety incidents, often with a hapless mannequin bearing the full force of the impact or incident. The photo below shows our team experiencing the result a small, lightweight coil accidentally being nudged – a domino effect capable of crippling a worker. Feeling the impact of that last coil slamming into the ground, the importance of stacking and securing coils correctly immediately hit home. Other experiments witnessed demonstrated lessons that are not immediately intuitive. For example, the value of a safety helmet’s harness can easily be dismissed – however an impact to an up-turned terra cotta pot protected by a helmet fitted with and without a harness, quickly demonstrates how the impact resistant nature of a helmet is severely compromised in the latter case. 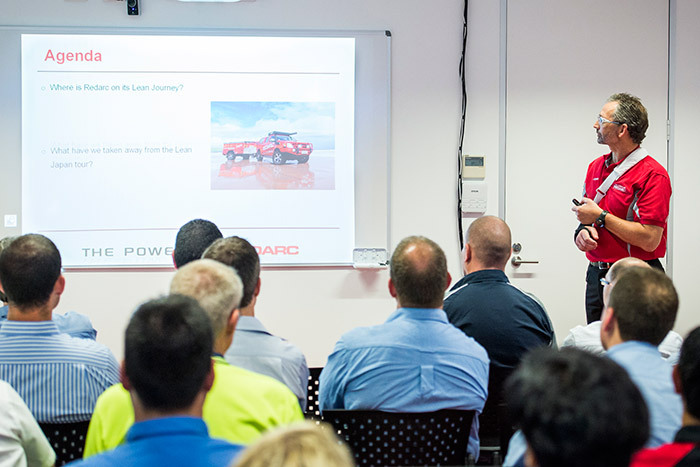 These lessons, when experienced, stick – and the program has been so successful that Isuzu now regularly invites clients – those staff that handle and use their product, to join these training sessions together with Isuzu Group staff. From a productivity perspective, the Isuzu Group has been benchmarked against rival companies in Japan, with findings showing that on a factory area basis, they are on average processing twice as much volume as their competitors with half the number of staff. In other words, their productivity on a per person basis is four times that of the remaining industry! Quality KPIs are similarly impressive with an extremely low number of customer claims relating to order errors or damaged products. Efficient operations supported by a high level of standardized work and their enterprise resource planning system developed in-house, not only allowed them to achieve a high processing volume, but in conjunction with their internal logistics division, has enabled them to respond to urgent orders with a lead time of between 2 to 3 hours from receipt of order to dispatch to their customer, without compromising their day’s production schedule. What appeared to be high levels of inventory of finished product, not what you would expect from a lean factory, turned out to represent only 1.5 days of stock, a level which they continue to work on to bring down (on a recent visit we witnessed them tracking (on a daily basis – on a whiteboard for all staff to see) reductions in the volume of inventory held on their premises – a KPI that one of their staff was leading the charge on). A hallmark of a strong lean culture, and one of the aspects that differentiates the Toyota Production System apart from the historical approach to industrial engineering, is the approach to staff development. The Isuzu Group’s approach is called Zenin Sankaku, or loosely translated, All-In Management. This fundamental philosophy is an approach that emphasizes the role that every staff member has in management and company improvement, and guides the company’s approach to teamwork, information sharing, 5S, etiquette and manners, and a sense of ownership and autonomy in leading initiatives within the company. Their approach is quite the opposite to a command and control hierarchical workforce structure, and differs in feel to the approach taken by many other companies we visit in Japan, including what we experience on our Toyota tours. Related to this philosophy is Isuzu’s annual General Employee Meeting which brings together all 800 staff from across Japan. Younger members of the workforce act as moderators for the meeting, which is carried out without any formal script and draws on many different employees taking the stage to share their ideas, thoughts and projects. Being dynamic in nature, and morphing to meet the current needs and transformation aspirations of the group, the meeting is different year to year, with no-one knowing what kind of meeting they will experience until it actually starts. Although an internal event, typically more than 100 shareholders and customers choose to join each year to witness the meeting. The results of this philosophy are evident in the vibrancy of the staff and effectiveness of the young workforce that are often called on to take leading roles in new initiatives and projects. It is this opportunity for development that makes The Isuzu Group an attractive choice for employment among the dwindling pool of young workers in Japan. All-In Management as a philosophy has been so successful that Isuzu has formalized the approach through a consulting and training program that it now provides to companies outside of the Metal One group. The Isuzu Group strives towards its goal of being a “Visionary Company,” taking inspiration from Jim Collins and Jerry Porras’ business classic Built to Last. Among the many programs that have been driven by their workforce in pursuit of this goal, is the concept of “Factory as a Showroom.” In its most simplistic form this could be interpreted from the viewpoint of merely maintaining a well-presented, pleasing to the eye factory, however in Isuzu’s case this is taken much further with the strategy including standardization and training for all of their staff in hospitality. Nice touches include the greetings received from staff as we enter their work areas, coffee served immediately on arrival, name plates to help us with seating, explanations given by different team leaders at each stop within the factory and office, attentiveness of staff and clear preparation for our arrival, prepared explanations accompanied by explanation boards, right through to our hosts waving us farewell until we are out of sight. Standardization and training extends to the bow given by operators to visitors on the shop floor. What we experience when visiting Isuzu as part of each Japan study tour was initially created to host visits by Isuzu’s current and prospective clients. The sales team invites prospective clients to meet with them at the service centers. Rather than a laborious, chest-beating sales presentation, the sales representative takes a prospect through their factory, introducing factory staff and letting them and the presentation of the factory do the talking. Japanese have a reputation of being particularly risk adverse, and are incredibly thorough when evaluating prospective suppliers. Is this company capable of consistent, high quality supply? Are they capable of achieving agreed lead-times? Are their operations appropriately managed and covered by standardized work? Do they take pride in their work? Will they let me down and my company down? The answers to these questions cannot be found in a sales presentation, especially for a manufacturing culture that prides itself on genchi, genbutsu (essentially, going and seeing for yourself). Walking out of an Isuzu service center, one can’t help but feel a desire to introduce this group as a trusted supplier for their company. For existing clients, a factory visit is often followed by a stroll past Isuzu’s visual Service Menu, which maps value-add services against those customers currently utilizing those offerings. This helps create conversations that leads to additional value-added services being considered by visitors. A desire to create such an experience is not the driving force behind Isuzu’s culture of manufacturing excellence, but instead is an outcome that is being utilized to build the group’s reputation and drive sales. Recognizing the value of this experience, Isuzu has formalized a strategy for showcasing their operations, which has culminated in their “Factory as a Showroom” program. This program has been so successful that in recent years they have harnessed staff (freed up from operations over the years through productivity improvements and automation) to consult to businesses outside their group, both domestically and internationally, to develop similar programs for their organization (if this is of interest, let us know and we’ll put you in touch). So, do you currently showcase your factory environment to clients? Are your operations at a high enough level that you can confidently invite prospective customers to walk the shop floor at any time? Are your people at every level and function within your organization confident and capable of interacting with visitors, dressed appropriately and well-versed in explaining their work content? Do you have a formal strategy in place for hosting visitors, or is this carried out in an ad-hoc manner? For both B2B and B2C companies, harnessing your factory as a showroom presents an enormous opportunity to build your company brand, develop stronger relationships with clients and support the business development team in driving sales. Shinka Management is a lean consulting and lean training firm with clients in over 40 countries. The Isuzu Group is one of the generous companies hosting Shinka Management clients on the Lean Japan Tour. To learn more about our lean study missions and to see video of other factories see: Lean Japan Tour. The big news in the automotive industry last month was the escalation of the ongoing Takata airbag affair. The fault in the airbag inflators was initially brought to the public’s attention with a recall of a limited number of vehicles in 2013. We have since had Takata state that it is does not know which airbags have been supplied for use in which vehicles, with worldwide recalls following involving dozens of models from several car manufacturers. Issues with Takata airbags resulted in at least 139 injuries across all automakers, and at least two deaths and 30 injuries in Honda vehicles. Last month I received a request from a London-based journalist for comment on the issue. She asked if the Japanese had lost control over production processes implemented by their suppliers and factories abroad. I did not consider this the case in general, and given when the defective inflators were manufactured, we can only comment on the state of the automotive supply chain from more than ten years ago. I think the bigger issue here, and the one that the US Government and press have been pointing to, is the response from Takata and Honda. It is difficult to know if the allegations of cover-ups levelled at Takata are true, and given the “anonymous sources” cited, it is difficult to credit these claims. However that Honda didn’t report 1700 incidents related to the airbags when it was required to do so is quite surprising. Each year we visit auto manufacturers in Japan, and the approach to quality and safety is certainly not lip service – they take these very seriously. Their priorities are safety and quality and only after those do they consider productivity – that is always the order. I’m not sure if it has been noted by the mass media over the past month, but a quick look at the list of Takata shareholders shows Honda with a 1.2% holding. It might be questioned if there was any additional motivation not to report because of this; however as it is common for Japanese companies to hold stakes in their peers, I personally don’t think this had anything to do with it. In the case of Takata, I’m really surprised that Shigehisa Takada, Chairman and CEO, has hidden from the press throughout the recall debacle – this is one of the most critical junctures in the history of this company (a seat belt recall in 1995 having been the other, again involving Honda and at the time being the second largest recall in the 30 year history of the Japanese Department of Transportation). Apart from some reshuffling of senior staff and a token pay cut in late December, the best the company has been able to do is a Chairman’s Statement which leads out with “We’re sorry – but don’t forget our products save more people than they kill.” Classy. Toyota experienced a similar setback in 2010 with their electronic accelerator pedal issue, but Akio Toyoda, President and CEO (who is widely respected by his staff in Japan, and the automotive industry in general) stepped up and showed real leadership. Despite not being behind the wheel at the time the quality issues occurred, he apologised profusely to all concerned and famously admitted “we pursued growth over the speed at which we were able to develop our people and our organization.” In short, Toyoda made sure Toyota took full responsibility and instructed his staff to provide complete transparency and full cooperation with investigators throughout. He didn’t play the blame game, and instead pointed the finger squarely at his own company. He gave a nod to his company’s lean manufacturing philosophy with regards to handling defects “…its a long-standing tradition and pride, we never run away from our problems or pretend we don’t notice them,” and in closing gave his personal commitment to restore the trust of Toyota’s customers, noting that his name was on every car. It is a shame to see Takata not following Toyota’s lead in this case. In the case of Honda, they have been doing a bit better following a bumpy start, however I’d expect much pressure on President Ito to step down at the end of the financial year in March. An interesting question that arises from all of this is the impact on the global automotive industry should Takata go out of business. They’re currently number two in an industry with only three large airbag makers. There would be incredible strain on the supply chain if Takata did meet its demise. The resulting duopoly would not be welcomed by auto makers for a number of reasons, not least for the risk to the supply chain. Takata’s share price has plummeted and I’d expect huge losses in the years to come, but it will be in the interest of the industry as a whole to make sure they survive. We can expect the industry to come to their rescue in some form. It is an unfortunate reality that no matter how good a company’s product development, production management and quality control systems are, a zero defect level is always going to be extremely difficult to achieve. For companies the size of Takata, Honda and Toyota, recalls are still going to be a fact of life. Rather than point to deficiencies in the management of the supply chain, what these incidents cast light upon is the effectiveness of the company leader to have good judgement and take quick action in times of crisis. This is what Takata and Honda should be reflecting on at this time. Paul Smith is Director of Shinka Management, a lean training company specialising in Japanese lean manufacturing practices. JAPANESE management techniques drawn straight from the production lines of that country’s industrial giants are making a surprising contribution to Australian firms as diverse as tech darling REA Group and transport operator Metro Trains. So-called “lean” production methods are exemplars of the rigour and consistency that Japanese industry — and indeed society — is known for. Lean philosophies have passed in and out of vogue in the western world and offshoots of lean — such as Lean Six Sigma — have been derided as fads. But thanks in part to tours run by an Australian management consultancy and the Australian Industry Group, these methods are revamping operations in a range of Australian firms in the embattled manufacturing sector and beyond. Shinka Management director Paul Smith, a devotee of lean who has been running increasingly popular tours to Japan to study production processes, says the list of firms putting them into practice is growing. “For the first five years we were averaging 10 to 12 people per tour per year,’’ he said. “This financial year we have taken three groups with 37 people all up. 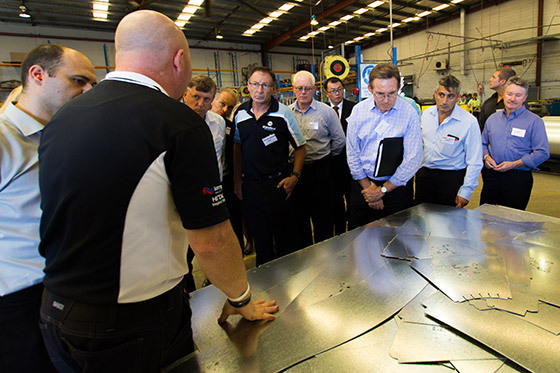 Executives and managers from Lion, Coopers and NZ building giant Calder Stewart are among those to have taken the tours to see operations at Toyota, Rinnai, Kirin, Sekisui and other Japanese industrial giants. “The lessons that can be learned are not just for manufacturing and food processors … governments, financial services businesses and white-collar industries can benefit too,” Mr Smith said. Lean is a catch-all term for a variety of industrial and managerial techniques and philosophies drawn from Japan — many from Toyota — on perfecting industrial processes and empowering the involvement of workers in problem solving. It has a vocabulary of its own — kanban, kaizen, 5S, just-in-time production — but loosely encompasses visualisation, waste minimisation and standardisation to deliver the kind of quality, efficiency and attention to detail Japan is famed for. Some of it can be seen as commonsense or even trivial. 5S, for example, is essentially about keeping workspaces clean and well ordered. But combine it with passion and commitment and you get monozukuri, the art of making things that defines Japan. The lack of understanding of these concepts in Australia is what some say finally convinced Toyota to pull the plug on manufacturing in Australia. It is the antithesis of the she’ll-be-right mentality, the emphasis on individuality and the disdain or lack of passion for perfecting superficially simple processes that exists here where management sometimes be more like herding cats. This, though, is beginning to change, according to Shinka co-­director Ben Sparrow who said Japanese firms, Toyota notwithstanding, were investing heavily in Australia and would want to implement their own methods. “Japanese investors are looking to transfer the lean management approach which is considered a given within Japanese Industry,’’ he said. AIG chief executive Innes Willox said the need for change was clear. “The need to strengthen productivity and develop leaders with process improvement capability is an urgent issue within Australian industry,’’ he says. Superficially, it’s surprising to see the name of the REA Group, a creatively-charged disrupter that has revolutionised the buying and selling of real estate through the realestate.com.au website and other property portals, pop up on the tour attendees list. But REA’s Herry Wiputra, a participant in one of the lean tours, said there were many principles, if not practices, that translated into the software field. He said the firm had applied the just-in-time production theory of the auto industry to software development and this tied in with the customer-focused, agile model of programming or development prevailing in the IT industry. Melbourne’s metro operator Metro Trains — straddling rising customer demand and an ageing rail network — is another convert to lean methods. Greg Curcio, head of the company’s improvement support team, is another tour participant who’s applied the theory to his firm through visualisation of problems and breaking down barriers between the shop floor and management. “The line between management and employee is blurred when it comes to striving for continuous improvement. The principles are about leadership through enabling and empowering workers,’’ he said. “Much, if not all, of the knowledge about how something works lies with the workers themselves. “And if there are problems, inefficiencies or unsafe work practices, management get involved and assist, but don’t dictate what the fix is,” he said. Shinka’s Paul Smith said the theory was easy enough to understand but it took leadership, time and commitment from the top to implement lean in a business. “Many companies we talk to in Australia fall into one of two categories: either they’ve tried lean for a while and haven’t seen results, or they’ve had some quick wins, patted themselves on the back, and now consider it done. “This misses the point that lean is about creating a culture of continuous improvement. While companies here are quick to tell us how well they are doing, Toyota, Rinnai and Kikkoman — who are absolutely dominant in their industries in terms of innovation, production, quality and marketing — emphasise how much improvement they still have to achieve. “They never let themselves feel satisfied. They have faced many of the same constraints as Australian companies relating to labour costs, exchange rates, foreign competitors — with the added stresses of importing raw materials and energy — but these companies are thriving despite the GFC and the 2011 disaster. “But there are some companies in Australia that are leading lights — such as the REA Group (which is majority-owned by News Limited, the publisher of The Australian) — where they have embraced lean as a culture and they are doing well. This article was authored by Rick Wallace and originally appeared in The Australian on Tuesday 26th August 2014. The original article can be found here. The following is a partial transcript of a guest lecture given at Carnegie Mellon University Australia on the 18th of July 2014. 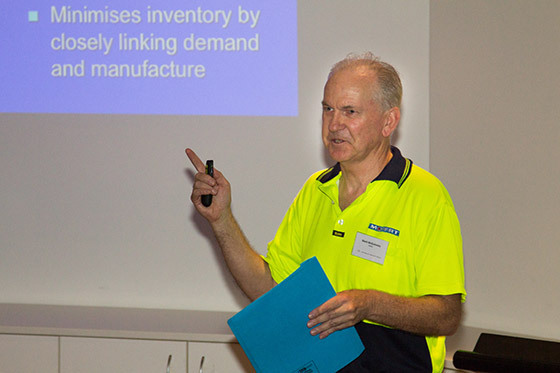 The lecture was delivered by Paul Smith as an Introduction to Lean Manufacturing for students undertaking the Master of Science in Information Technology course. The talk focuses on removing waste from business processes to improve productivity, quality and safety, and includes insights from the kaizen training and lean tours that Shinka Management runs in Japan. As part of the lecture a discussion was held on the relevance of lean to the role of the CIO. As the most senior executive in an enterprise responsible for the information technology and systems, the CIO often plays a central role in business transformation projects. An understanding of the fundamentals of lean is relevant in this role, as more and more we are seeing business transformation projects being labeled as lean or agile. These projects often miss the point that lean is a culture that is developed over years, not a one-off undertaking. Lean is a continuous improvement philosophy which is Synonymous with Kaizen or the Toyota Production System. The history of lean management or lean manufacturing is traced back to the early years of Toyota and the development of the Toyota Production System after Japan’s defeat in WWII when the company was looking for a means to compete with the US car industry through developing and implementing a range of low-cost improvements within their business. In brief, lean management seeks to implement business processes that achieve high quality, safety and worker morale, whilst reducing cost and shortening lead times. This in itself is not unique to Japan. What sets lean management apart, and makes it particularly effective, is that it has at its core a laser-sharp focus on the elimination of all waste from all processes. So what do we mean by waste? Here we are referring to any expenditure of resources that doesn’t add value for the customer. In lean manufacturing there are generally considered to be seven types of waste. Whilst we discuss these in terms of their origins in the automotive manufacturing industry, this same thinking can apply to almost all industries. These wastes can all be applied, for example, to the preparation and serving of a hamburger, logistics operations or a call center – this thinking is not limited to manufacturing. We can typically look at the waste within a business process by considering the labour and equipment effectiveness. For example for labour, there’s usually a stark difference between the paid time for a resource and the time that the resource is actually adding value for the customer. We can define this difference through a series of losses. Utilisation Loss is generally the supervisor’s responsibility, and may occur if parts are not available or the operation is not setup such that the operator can perform at their best. Performance Loss is the operator’s responsibility. This includes not meeting standard times and not following standard operating procedures. Method Loss is the responsibility of engineering and management across the organisation. For example, if a product was not designed to be easily manufactured then this would be the R&D team’s responsibility. We’re often also interested in the availability and effectiveness of equipment being used. Analysis of equipment effectiveness is especially important to focus on when dealing with high-cost equipment, such as in drilling, mining or the airline industry. In these cases a business is only making money or providing value when its equipment is operating. Rather than talk about theory, let’s look at a couple of examples from industry. I’ve chosen this first example as an introduction to two fundamental approaches used in lean management, time studies and work sampling. This example is for an Australian power utility and focuses on the field asset inspection process. Utility companies, whether they be power, water, gas, or telecommunications have a responsibility to continually assess the condition of their assets, and this is especially true for utilities operating in a regulated environment. A power utility typically has dozens of asset inspectors operating in the field. The task of the asset inspector, in simple terms, is to carry out a series of visual inspections for a pole and its associated infrastructure (wires, insulators, transformers, etc.) and report on the current condition and any abnormalities. This task involves differing levels of complexity depending on terrain, configuration at the top of the pole, and reporting requirements and can take anywhere from 5 to 40 minutes for a single pole. Time studies and work sampling can be used to analyse asset inspection process. Time studies involve analysing individual cycles of a process, in this case the inspection of a single pole. The motion of the inspector and movement of tools is recorded and each individual element (step) in the process is listed along with the time required to complete it. …a technique of establishing an allowed time standard for performing a given task, based on measurement of the work content of the prescribed (standard) method, with due allowance for fatigue and for personal or unavoidable delays. Definition of time study, from: Salvendy, G. Handbook of Industrial Engineering, Second Edition, John Wiley & Sons, New York, 1992. - What elements (steps) exist within the process? - What order are they performed? - Does a standard operating procedure exist, and is it being adhered to? - Is there variability in the way the process is run from cycle to cycle, or between inspectors? We can then use the results of the time study, either manually or using time study software, to understand where improvements can be made to reduce the time required for the task and improve consistency. Improvements are found through analysing each element and then working through a process of eliminate, combine, rearrange and simplify. Eliminate – Question whether or not the work or operation can be omitted, and eliminate those which are unnecessary. It is necessary to consider elimination before any other improvements. Combine and Separate – For those operations which cannot be eliminated, study the manner in which they should be performed. The study should be done without bias from accepted ideas or prejudice. Attempt to reorganize work in as simple a way as possible. This is combination and separation. Rearrange and Substitute – Consider questions such as when to do, in what order, how can work be done easily, etc. Simplify – Consider improvements to make each operation simple and easy, to shorten distances, to lessen weight etc. Eliminate – Remove the need for the inspector to walk around the car to fetch tools, by storing tools on the same side of the car as the inspector. Combine and Separate – Merge the tasks of wire inspection by binoculars and photographing top of pole by providing inspector with binoculars that include a camera function. Rearrange and Substitute – This can refer to changing the order of the elements or changing the layout of the work area. An example of the later would be to attach lighter tools required for the inspection to the inspector and attach other tools to a board which can be easily attached and detached to the pole (e.g. by use of magnets). Simplify – Reduce the time required to upload photos during each inspection by using wireless upload to laptop rather than wired upload. Through some simple changes and low-cost improvements, its possible to develop a standard layout and procedure that allows the inspector to complete 58% more inspections in the same amount of time. Work sampling is often used together with time studies. The purpose of work sampling is to understand how an operator uses his or her time during the course of a day’s work. A record of activities is taken at a set interval, for example every minute, and a day is summarised according to time spent performing main tasks, performing auxiliary tasks and idle. The purpose of work sampling is to help identify how more time can be allowed for performing main (value-adding) tasks as opposed to auxiliary tasks such as setup and shutdown, and tasks that are not work-related. Although not the main role of work sampling, the mere act of carrying out a work sampling activity can help in identifying a wide range of improvement topics relevant to the task be studied. The second example I’d like to show is for an Automotive Dealership. This example is based on the Dealership Process Improvement offering that has been implemented in quite a number of countries with the purpose of improving customer experience and dealership productivity. The typical customer experience in taking one’s car for a service involves dropping the car off at a dealership or mechanic in the morning and picking it up in the evening. As part of the Dealership Process Improvement program, a One Hour Express Service offering can be provided. During the lecture we looked at an analysis that focuses on movement and tasks performed as part of a standard service. The changes include the move to using two mechanics working in unison, and other improvements that are simple and not capital intensive. The ordering and assignment of tasks allows each mechanic to reduce the amount of walking they do, and the design of the express service trolleys allows for more convenience and less movement away from the work area. The result is that the service can be carried out with two mechanics in under a third of the time it originally took with one mechanic. The Dealership Process Improvement offering has been customised and implemented for a large number of automotive companies. So these were just a couple of examples, with a focus on wasted movement (6th in the list of wastes above) because it is easy to visualise. Lean management and lean manufacturing encompasses so much more. Some of the concepts and tools that are commonly encountered in lean are shown here. However, lean is not so much about using a set of tools to implement spot changes, but more about how to foster continuous and sustained improvement across companies – and this is an area that Japanese companies are particularly strong in and an area where much of the English literature available on lean is lacking. Seiri (Sort) – Identify and separate the necessary, occasionally used and unnecessary items. Seiton (Set in Order) – Arrange necessary and occasionally used items into clear designated storage positions. Seiso (Shine) – Thoroughly clean the workplace and equipment. Cleaning is an inspection. Seiketsu (Standardise) – Visual aids, 5S manuals, 5S audits. Standardise 1-3S. Shitsuke (Sustain) – Practice 5S to the point where it is a natural part of your work. Above: The process of simply carrying out 2S, that is Sort and Set in Place, makes it easier to find tools when needed, and with less chance of injury. When there is a defined place for everything, such as in the example above, or when using shadow boards, it is very easy to understand if something is missing with one glance. This helps avoid stoppages to search for tools in a manufacturing environment, and in some environments such as hospitals, can mean the difference between life and death in an emergency situation. Simply setting and maintaining a defined order for manuals in this nurse’s station in Japan reduced the amount of document-related work time by more than half. Note the use of the yellow and pink tape, which allows us to tell if anything is missing or in the wrong place with one glance. The above photo is from a foundry in Japan, the use of standard layouts here helps shop floor managers determine with one glance if production is ahead or behind. If there are no completed products at the position where the flags are, this represents a situation whereby production is behind. This steel coil handling facility near Nagoya represents a fine example of 5S achievement. The productivity, quality and safety outcomes of such a work environment are significant. This provides a foundation allowing for standard work, visual management, and other elements of lean management to be applied effectively. Toyota is one of the largest companies in the world, ranking at about 14th in terms of revenue and with 300,000 employees globally. The company manufactures approximately 10 million cars per year. If we were to assume 30,000 parts to each car on average, that’s 300 billion parts handled annually as part of Toyota’s global operations. It may be surprising to learn that the scheduling and inventory management system at the heart of these operations is not a complex enterprise resource planning system, but a remarkably simple concept – that of the kanban card. There’s a lesson here for the future CIO or CTO that the best solution for handling complexity isn’t always going to be a high-cost cutting edge information system. By considering process first and then system, Toyota could identify this tool as being an appropriate solution to help manage their supply chain. Whilst the concept is simple, use of kanban is not recommended for most companies. Proper implementation of kanban requires strict discipline to be effective, and without a good foundation of 5S and other lean fundamentals, implementation of kanban is destined for failure. Some of the best lean companies in Japan, such as Rinnai, waited 10 years after commencing their lean journey before considering the use of kanban – without the lean fundamentals and culture properly established, a kanban system can be damaging. Here we have a summary of the hallmarks of companies that are succeeding with lean. These point to the role of the person at the top of the company as being of utmost importance in terms of developing and fostering a lean culture. As our own benchmark for a successful lean company, we keep turning back to Rinnai under the leadership of Chairman Susumu Naito. The company’s motto is “Quality is our Destiny” and the 87-year-young Chairman continues to spend time on the shop floor every day together with his employees in a never-ending push towards perfection. Related topics worth being aware of are that of agile management and agile software development. Richard Durnall, Chief Technology Officer for REA Group, credits lean thinking and agile management for much of REA Group’s success over recent years. Amongst other benefits, lean and agile help REA Group’s staff to collaborate more effectively and shorten their lead times for releasing new services and features for their customers. In summary, some of the key takeaways from this session, especially for the aspiring CIO or CTO, are the following points. Paul Smith, PhD, is a Director and lean consultant with Shinka Management Pty Ltd, specialising in the transfer of of Japanese lean management know-how to Australian industry. Shinka Management provides lean training services focusing on practical, implementable solutions for improving business processes and increasing productivity and competitiveness. With the support of the Australian Industry Group, Shinka Management runs lean study tours to Japan to promote consciousness of Japanese management practices amongst Australian and New Zealand industries. Our most recent Lean Japan Tour was held during the 18th through 24th of May in Tokyo and Nagoya, with the aim of showcasing the rich history that Japanese industry has in the fields of lean manufacturing, industrial engineering and continuous improvement (kaizen). The kaizen tour has been an annual initiative of Shinka Management for the past eight years and is designed to provide companies with lean training and first-hand experience of the world-class application of kaizen within Japanese industry. This year’s tour group comprised industry professionals from multiple countries representing a variety of industry sectors. During the week-long kaizen tour participants learned about the implementation of lean manufacturing and kaizen in some of Japan’s top companies. Participants experienced seminars on lean manufacturing, operations analysis, Japanese business culture and several factory tours. The factory tours and reception provided by the host companies throughout the week were excellent. Isuzu Corporation (Metal One Group), which specialises in the processing and sales of cold rolled steel was a standout in terms of the company’s dedication to employee welfare and motivation, and their efficient use of space within their service centres. The tour group was impressed by the level of excellence on display in terms of productivity and organisation within Isuzu’s immaculate Gifu Service Centre. Inoac, a world-leading innovator and producer of polyurethane, plastic, rubber and composite materials, was another standout visit. The company provided a warm reception, and led the group on a tour of the company’s Anjo plant prior to a discussion with several members of their senior management team regarding their production management systems and kaizen activities. 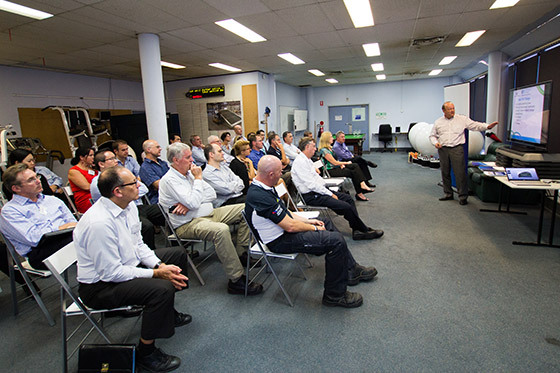 Two days of the tour were dedicated to lean training at a Toyota Group lean training centre. The group developed their understanding of the Toyota Production System (TPS) during their stay, and in addition to classroom and hands-on training, experienced TPS in action on the floor of a vehicle assembly plant and through visits and management discussions with two Toyota Group suppliers. The application of Just-In-Time manufacturing, visual management, supplier development and kanban systems were all covered. The tour also included visits to two multinational companies applying lean principles within the food and beverage industry. Kikkoman, famous for its excellence in R&D and innovation in the production and distribution of soy sauce, was the tour group’s first visit. In addition to a plant tour, a management discussion was held with Kikkoman staff presenting on two of their recent kaizen projects. ITO EN, the world leader in production and distribution of green tea products, was the group’s final visit. The tour included ITO EN’s R&D and quality control labs, tea processing and packaging, and their new coffee roasting facility for their Tully’s Coffee brand. The group met with representatives from ITO EN’s production division responsible for administering the company’s kaizen and employee suggestion schemes. In addition to learning about Japanese management philosophy and productivity practices, the tour group spent the week immersed in Japanese culture, received training on Japanese business culture, and experienced local food, drink, entertainment and customs. 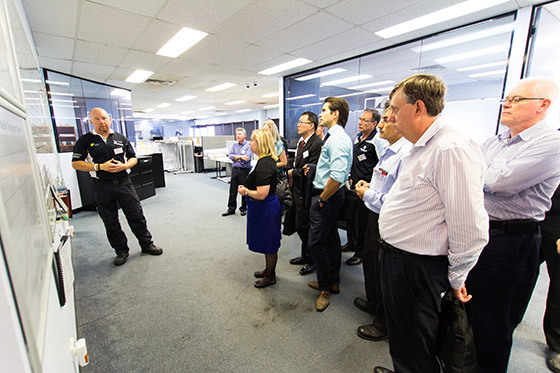 The tour was led by Shinka Management in conjunction with the Australian Industry Group and Simply Lean Business Solutions. The tour is open to participants from all countries. For further details see the Lean Japan Tour page. The tour is page is also available in Turkish (Yalın üretim Eğitim), Arabic (جولة التعرف على نظام الإنتاج والتصنيع الرشيق في اليابان) and German (Lean Manufacturing Ausbildung). Shinka Management and clients were interviewed by Leila Henderson of in-Business Magazine South Australia for the following article on our annual lean study mission to Japan. The PDF version of the article that appeared in the February/March 2014 edition of the magazine can be viewed here. Japan has been a beacon for success in manufacturing for over half a century, yet it has faced challenges that would have crippled another nation – a market downturn caused by the global financial crisis, the 2011 triple disaster, a drop in exports to China, and the high value of the yen to name a few. Now South Australian companies have learned first-hand how Japanese businesses implemented productivity improvements and developed strong management foundations over recent decades that allowed them to weather the storm and remain competitive on the global stage. 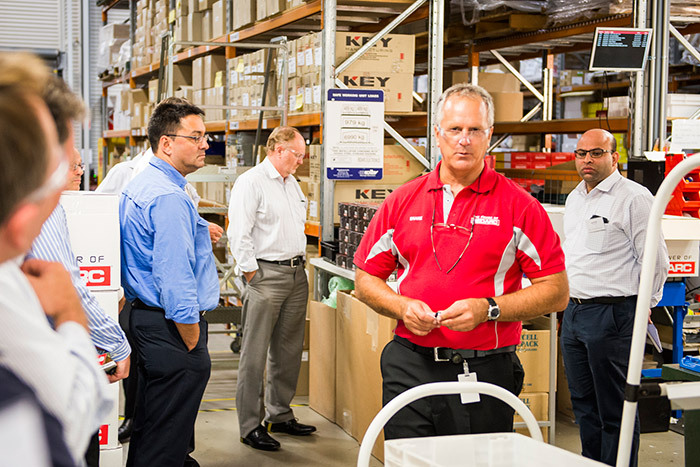 The Australian Industry Group Lean Japan Tour, led by Wayville-based lean manufacturing consulting firm Shinka Management, has provided businesses like Redarc Electronics and Coopers with invaluable insights and first-hand experience of Lean best practice. Tour leaders Paul Smith and Ben Sparrow of Shinka Management organised, facilitated and interpreted during the 2013 tour. Innes Willox, Chief Executive of the Australian Industry Group, views opportunities such as the tour as important to developing industry competitiveness. The 15 participants on the 2013 Lean Japan Tour came from a broad range of industries, including automotive, manufacturing, food and beverage, transport, government, and software development. 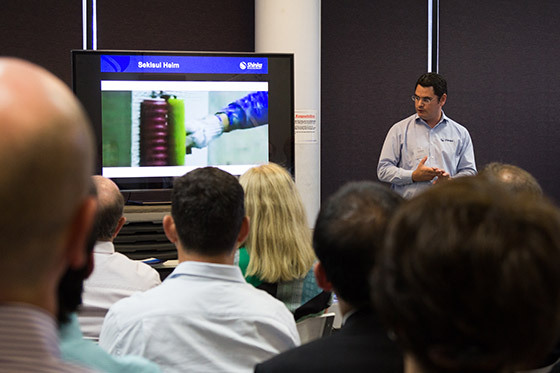 “The participants discussed with Japanese management how to establish, implement and sustain lean programs, and they brought this knowledge back to Australia for the betterment of their organisations and the industry as a whole,” Paul said. Shinka Management planned last year’s tour to include host companies in several different industries ranging from large corporations right down to organisations that employ fewer than 50 people. “This was noted by participants as useful to see how improvement programs differ depending on scale and type of organisation, yet still have a common foundation and concepts,” Paul said. In addition to looking at companies that had implemented lean over several decades, the tour included a visit to a company that had only recently set out on its lean journey. 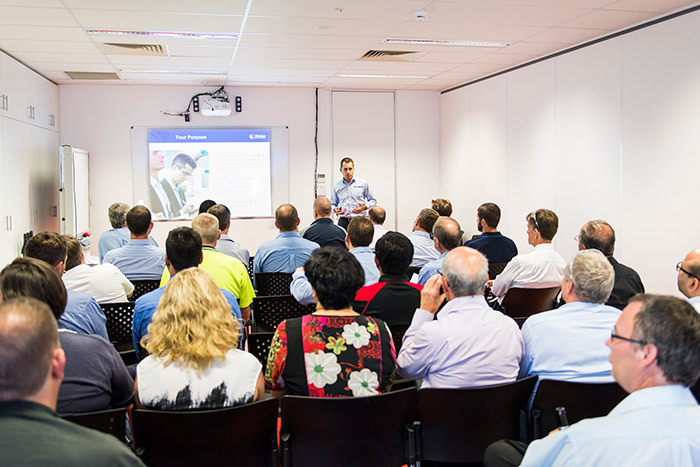 “Managers shared with us their learnings on how to implement cultural change in their workforce and achieve significant tangible results from lean implementation that saved them from bankruptcy following the GFC,” Paul said. Jeremy Hawkes, Managing Director of Bowhill Engineering, attended the Lean Japan Tour as part of his Industry Leaders Fund scholarship. He said he chose to join the tour because Bowhill Engineering had just begun its lean journey. “With eight of our staff beginning a Certificate IV in Competitive Manufacturing, I felt it was important to witness first-hand what a world-class productive and efficient manufacturing environment looks and feels like,” Jeremy said. The group had several exclusive opportunities to visit companies such as Rinnai and Chuo Malleable Iron that generally do not accept groups into their factories. They also spent two days at a Toyota kaizen training facility, only made possible through the close relationship Shinka Management has with Japanese Industry. Andrew Marshall, Production Manager of Wineworks Marlborough in New Zealand, admired the Japanese systems, machinery, processes and people. The Lean Manufacturing Tour of Japan has taken place every year since 2007. This year two tours will be held from 18-24 May and 9-15 November. “A key difference for 2014 is that we are looking to add a couple of food and beverage companies into the itinerary,” said Paul Smith. The tour also includes cultural activities and a seminar on Japanese business etiquette and doing business with the Japanese. Kavanagh Industries is a Western Sydney success story, specialising in the manufacture of sheet metal ducting. 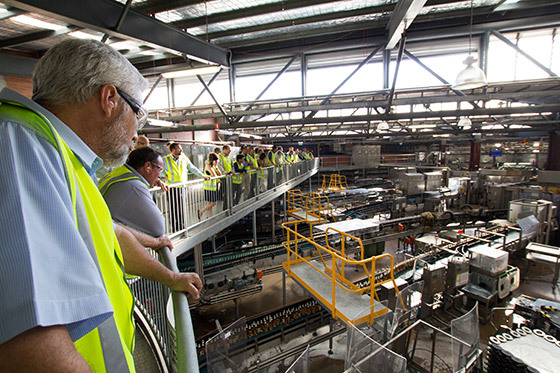 In February 2014, Managing Director Aidan Kavanagh invited members of the local lean community to join a factory tour of Kavanagh Industries’ Smithfield facilities. 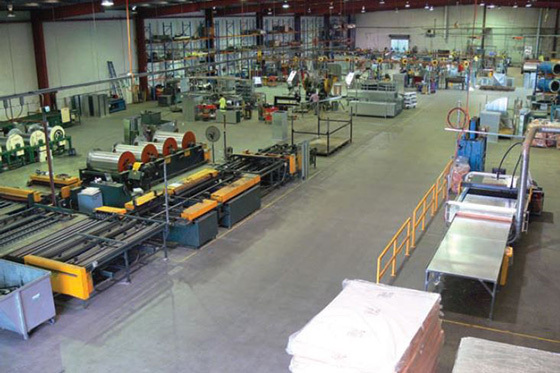 Kavanagh Industries is a family business that has grown to become Australia’s leading sheet metal duct manufacturer. The company’s 17,000 square metre Smithfield facility houses major equipment such as coil fed plasma cutters, automated straight duct lines, a spiral lock-seam round duct machine, and other automated cutting, turning and welding processes. The Smithfield facility is set up to be as flexible as possible to cater for orders varying in type, size, shape, weight and material. The excellent application of lean thinking to a job shop environment was impressive, especially given that many companies use made-to-order production as an excuse as to why they can’t achieve lean production. In an environment where product type, specification, volume and fabrication time varies by product, and where it can be difficult (but not impossible) to determine a standard time for each product, it can be easy to dismiss lean. Handling methods will differ when products are heavy, large and of varying shapes and in many cases it can be difficult to move products between operations. Job shops tend to have frequent welding and grinding operations which lead to dirty work spaces, and it can be easy to amass large quantities of surplus material. Despite these challenges, the lean implementation and presentation of Kavanagh Industries’ operations were exemplary. Take for example the implementation of 5S, which can often suffer in made-to-order factories for reasons given above, and at times of workload peaks. The Smithfield facility was a well laid out lean job shop, allowing for safe and efficient work. Good use of shadow boards freed up space in work areas, cables and cords were kept in check, and as the saying goes, there was a place for everything and everything in its place. 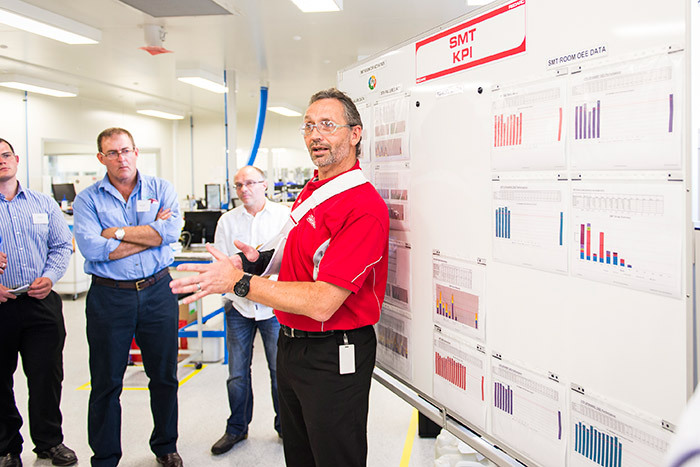 In leading us through the facility, Aidan noted that production targets for the day are set each morning by operators (rather than by management), and the production control system allows for simple, visual communication to all of these targets and how well the team are tracking against them. Worker morale and employee engagement appeared strong. The operators are multi-skilled, motivated to perform and their efforts are appreciated and rewarded appropriately. The room which hosted our group for the presentations following the tour, was filled with equipment that had been purchased with the well-being of employees in mind, including meditation chairs, fitness equipment, pool and table-tennis tables, and an adjacent massage room where each employee receives a massage each week courtesy of the company. Kavanagh Industries has been recognised as an employer of choice previously, and the Today Tonight feature on the company is well worth a look (followed by reflection as to what else could be done for those employed at your company). Love the closing comment. At each turn throughout the tour, both at Kavanagh Industries and the adjacent KS Metal Fabrications, there were signs of enlightened management and the benefits that result in terms of productivity, quality, safety and importantly employee welfare. A briefing on our recent lean study mission to Japan followed with presentations from tour participants Aidan Kavanagh, Managing Director of Kavanagh Industries, and Lee Baines, Manager Best Practice Unit of Enterprise Connect. 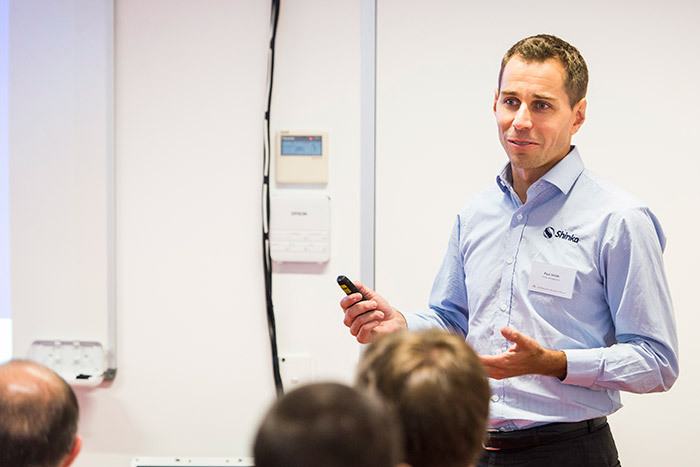 Ben Sparrow, Director and Lean Consultant of Shinka Management spoke about three standout companies that we have visited on our lean tours to Japan – Rinnai, Sekisui Heim and Suzaki Industries. Rinnai especially is a standout, and Ben has written about his experiences with the company previously (See: My New Lean Benchmark; The Taiichi Ohno Visit That Triggered Rinnai’s Lean Excellence). 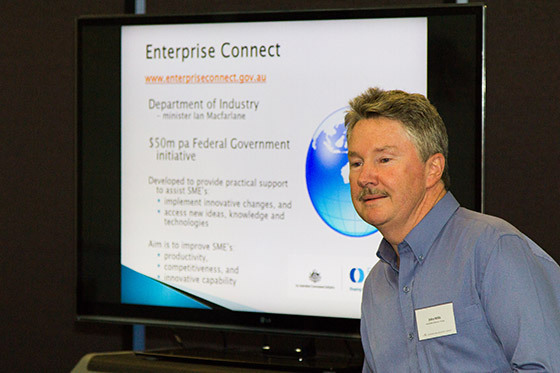 John Mills, Business Adviser, Australian Industry Group, also provided the group with a presentation regarding Enterprise Connect’s funding and support offerings. Thanks is extended to the presenters, and especially to Aidan and his team for hosting us. 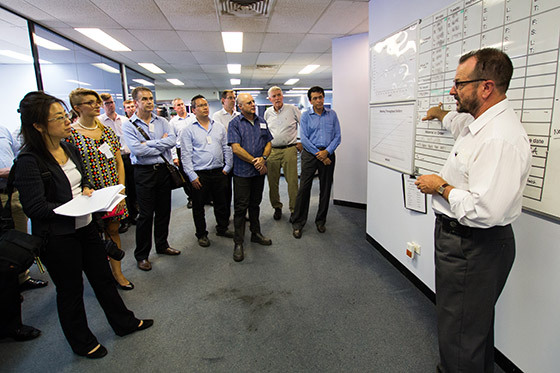 If you are interested in learning of dates for future lean factory visits and lean training events in Australia or Japan, we invite you to join our mailing list via the form at the top right of this page. In November 2013 two staff from Lion’s brewing operations joined us on our Lean Japan Tour, and on their return kindly agreed to host a brewery tour at their Castlemaine Perkins Brewery this February for our clients in South East Queensland and local members of the Australian Industry Group. Lion is well-known in Australia as a leading beverage and food company employing 7,500 staff. The company boasts a portfolio of market-leading brands in beer, spirits, wine, milk, fresh dairy foods, juice, cheese and soy beverages. Lion’s Castlemaine Perkins Brewery is famous for its signature XXXX Bitter Ale and Lion’s biggest selling brand, XXXX Gold. The brewery is well equipped to host visitors, and the tour started with an audio-visual explanation regarding the brewing process. The group then proceeded through the brewery to witness the various processes described. The highlight of the tour was the session held in the brewery’s Manufacturing Excellence (MEX) room where Manufacturing Excellence Leader Chris Sheehan shared details of Lion’s MEX program and lean journey. Lion’s continuous improvement program focuses on several themes with autonomous maintenance, asset care, set-up time reduction and quality identified as key pillars of the MEX program. Teamwork in eliminating waste, 5S discipline, visual management and structured problem solving for continuous improvement are also highlighted, with safety and leadership as a foundation of MEX. 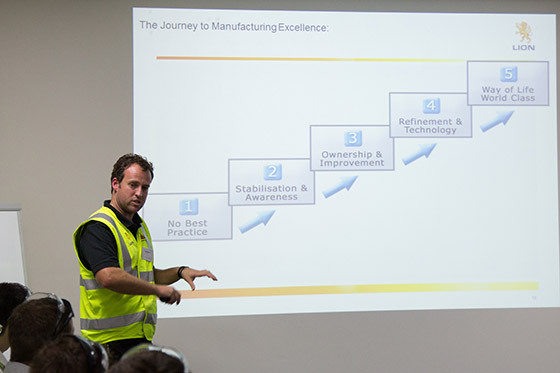 Presentations and a report on the November 2013 Lean Japan Tour followed from Mark McGuinness, Manufacturing Manager of Moffat, and Ben Sparrow and Paul Smith, Directors of Shinka Management. Thanks to Lion for hosting the brewery tour (and for putting on the drinks!) and to Mark McGuinness of Moffatt for his talk. 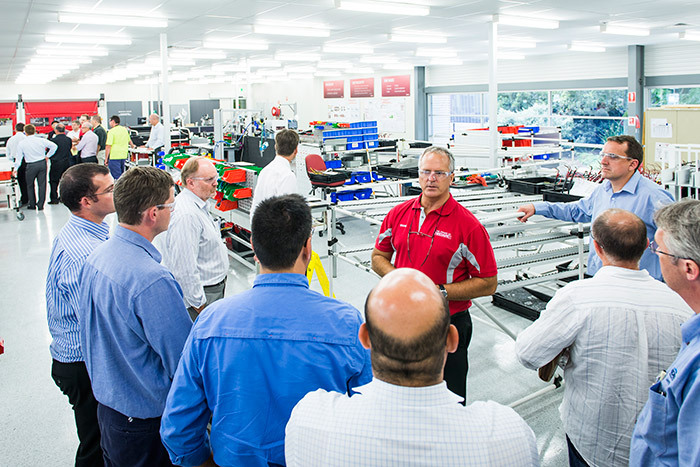 We look forward to running our next factory tour in South East Queensland in mid 2014. 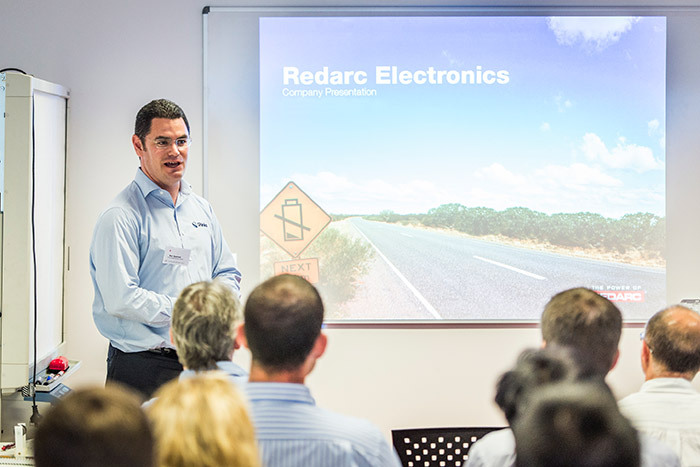 On the afternoon of the 3rd of February 2014, 38 leaders of South Australian industry gathered in Lonsdale for a factory tour of Redarc Electronics. 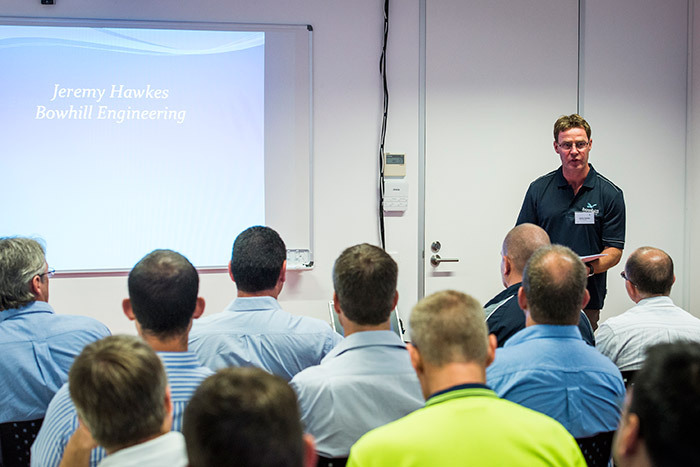 The event was one of four organised in Australia in early 2014 by Shinka Management, with the Redarc tour held with the support of the Australian Industry Group under the banner of the South Australian Lean Manufacturing Special Interest Group. Redarc Electronics has over three decades of experience in designing and manufacturing electronic voltage converters and related products for commercial and recreational vehicles. The company is well known for its industry-leading range of inverters, battery chargers, power supplies and customised electronic modules. The factory tour commenced with an introduction from Production Manager Shane Wreford on Redarc’s management philosophy, quality control initiatives and production challenges. Participants were divided into three groups for the site tour, visiting Engineering and R&D, Assembly and the Finished Goods Store. The factory tour included a visit to Redarc’s Surface-mount technology facility, hosted by SMT Supervisor Johan Otto. Innovation and focus on ensuring quality and customer satisfaction were evident in walking through the facility. A focus on right-first-time was highlighted, and the product flow achieved throughout the site ensured that any issues were immediately recognised and resolved. Use of visual management throughout the facility for both real-time and retrospective tracking of operations was impressive. 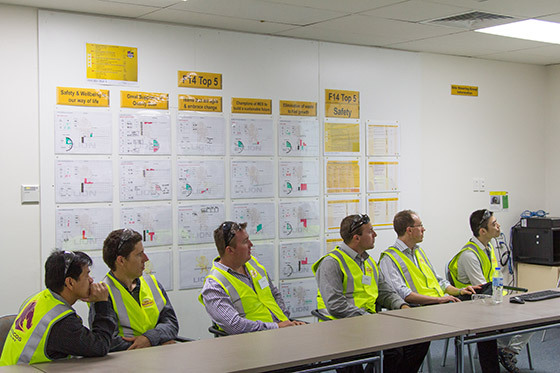 Shane and Johan were participants on the November 2013 Australian Industry Group Lean Japan Tour, and improvements made to their management processes and operations were highlighted during the visit. One improvement was showcased that enabled quicker picking of parts, an innovation adapted directly from a technique demonstrated during the Gifu Auto Body site visit. 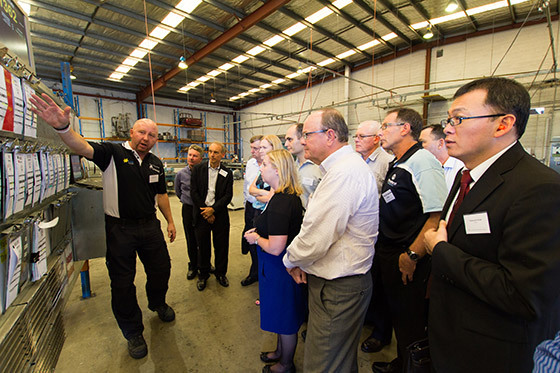 Following the site visit, the focus of the event turned to the Lean Japan Tour held in November, with tour reports provided by South Australian tour participants. 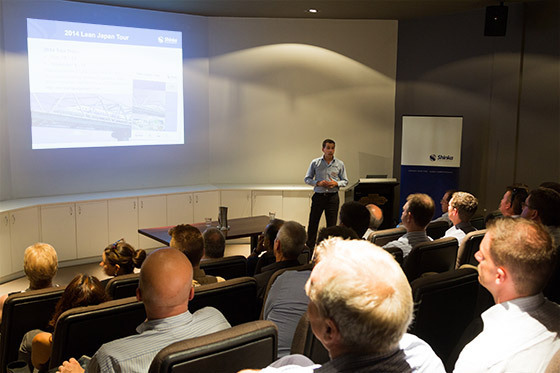 Jeremy Hawkes, Managing Director of Bowhill Engineering, Thinus Steyn, Managing Director of ZF Lemforder Australia and Johan Otto of Redarc Electronics provided presentations on their experience and learnings from the lean study tour to Japan. My perspective of how high the bar can go was definitely challenged by what we witnessed in Japan. Lean is a way of life – not a project. As a high mix low volume electronic manufacturer in Australia the challenges to survive are huge. We saw the lean tour as an opportunity to go to Japan and see how they reduce waste. Thanks to Shane and the team at Redarc for their hospitality in hosting us, and to Jeremy, Johan and Thinus for their presentations. Photographs by Juan Photography. 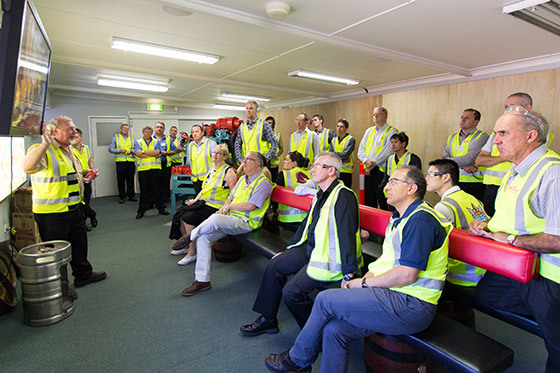 The Redarc Site Tour was the first of four factory visits held around Australia in February and March 2014 to showcase learnings from last year’s Lean Japan Tour. 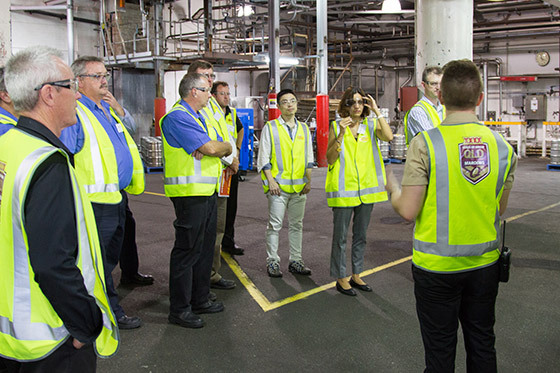 The other visits were held at Lion’s Castlemaine Perkins Brewery in Brisbane, Kavanagh Industries in Sydney and REA Group in Melbourne. 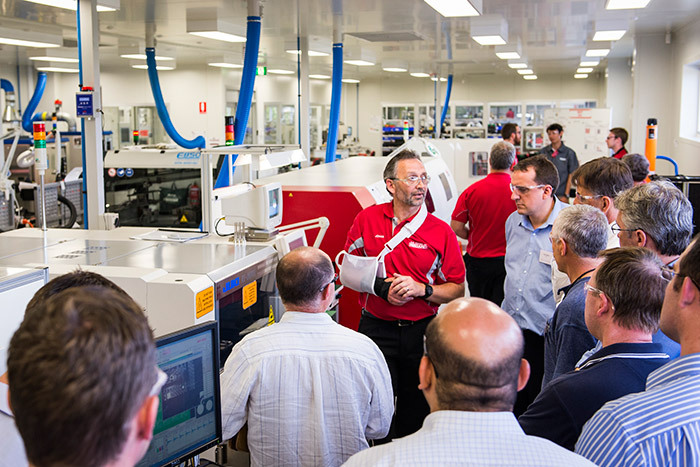 The next round of factory tours in Australia will be held in mid 2014. To be notified of dates and locations, sign up for the Shinka Management mailing list or drop us a line. 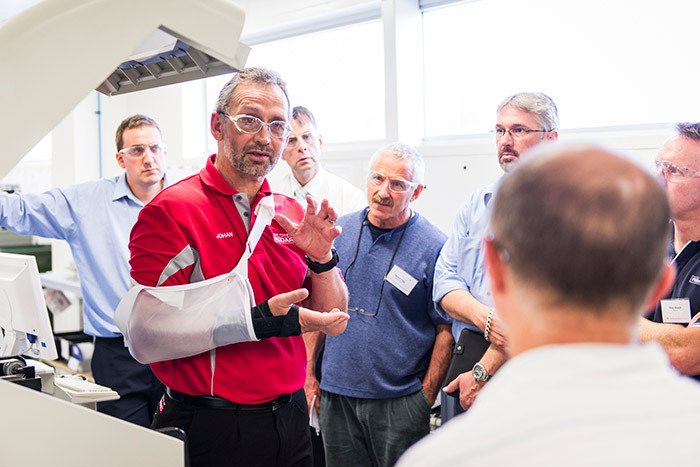 This year’s Lean Japan Tours will be held in May and November – for further information see the lean study tours page.